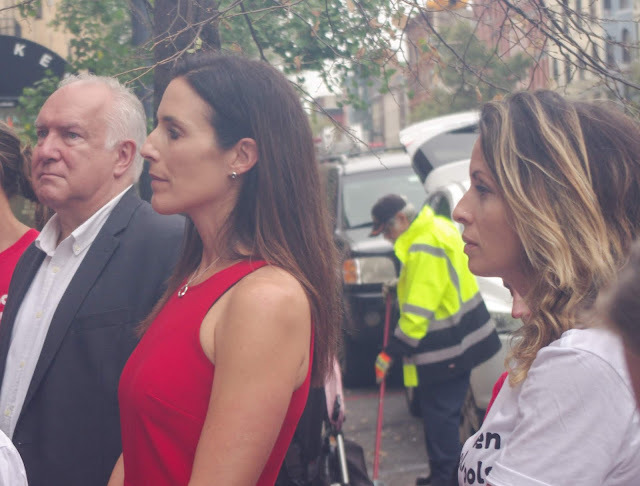 BoE President Tom Kleupfel and BoE trustee Sharyn Angley (l) attended the announcement for the revised Hilton Hotel development for downtown in Hoboken outside the former Y on Washington Street. "We are happy to see that collaboration with the mayor and the developer has resulted in a 50% increase in the community give back to $4.5 million and that the scope has been expanded to include critical infrastructure, affordable housing, and charter schools. Additionally, KMS also committed today to fund immediately the much-needed feasibility study to officially launch the restoration project for the former YMCA so that it can be shovel-ready when the remainder of the give back is paid after the hotel opens. This is what is possible when our city works together."